Just got a tip that the latest version of FSEarth is now available: Version 3. 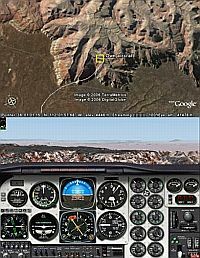 This tool lets you integrate Google Earth with Microsoft's Flight Simulator 2004. The new version of FSEarth has some nice new features including: the ability to view your flight plan from MSFS in Google Earth, ability to see other aircraft in the MSFS world (including the AI planes), and it supports multiple configurations (two separate computers, two monitors, or just two windows). (See the earlier GEB review) This is a really cool way to use Google Earth's client/server capabilities to link applications together and see GE's unique visualizations. Watching the 3D views in GE with its real-life satellite/aerial photos and comparing them to MSFS's simulated views is very interesting. FSEarth is available to try for free, or you can buy it for a very reasonable price. If you are into GE and Microsoft Flight Simulator, you should at least try this out. Respuesta: Asegúrate de estar utilizando la última versión de Google Earth.